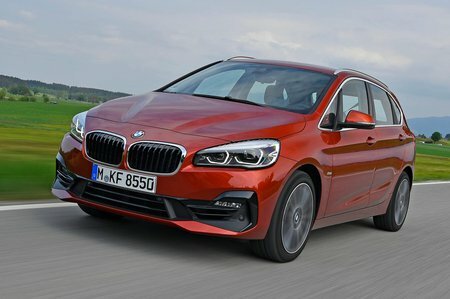 BMW 2 Series Active Tourer Performance, Engine, Ride, Handling | What Car? Although 2.0-litre petrol and 1.5-litre diesel engines are available, we’ve only driven the 2.0-litre diesel engine in the 218d and 220d, plus the three-cylinder 1.5-litre turbocharged petrol engine in the 218i and 225xe plug-in hybrid. The 218d is punchy enough once it gets going at around 1800rpm, but if you let the revs drop too low or hit a steep hill, you’ll have to change down a gear to maintain your speed. You can add an optional eight-speed automatic – one of the best autos in the class – that does a good job of disguising the engine’s shortage of low-down response. Even with the auto 'box, you’ll still notice that the 218d isn’t fast, so you’ll occasionally need to work it hard for decent overtaking performance. Given that the 216d is significantly down on power and torque, we’d recommend test driving one with a few people on board to see if it’s gutsy enough for your needs. The 220d is worth looking at if you value a sportier-feeling engine or if you regularly carry a full load of passengers and luggage. It certainly makes the 2 Series Active Tourer feel significantly faster and more flexible, although this is in part down to the standard eight-speed automatic gearbox. Just remember that the 218d is usefully cheaper to buy and will be more than adequate for the majority of buyers – even those who do lots of motorway miles. The 218i’s engine is taken from the Mini – this might sound like it would struggle in a car as big as the 2 Series Active Tourer, but that’s not the case. You will have to work the engine fairly hard through the standard six-speed manual gearbox if you want hearty acceleration, but generally it’s just as adequate in everyday driving as the 218d, thanks to a broad spread of torque. A seven-speed dual-clutch auto is optional and won’t harm performance, according to official figures. That same three-cylinder turbocharged petrol engine is also found in the 225xe, alongside a battery pack and rear-mounted electric motor. Performance from a standing start is strong, but this tails off as speeds increase due to the weight of the added hybrid components. The 2 Series Active Tourer’s ride is a little unsettled at low speeds and over rough surfaces, but it’s a lot better on fast country roads and motorways, and deals with large imperfections such as speed bumps very well. This is at least true of cars on relatively small 16in and 17in wheels; we’d avoid the 18in and 19in rims. Just remember, if you do value comfort over all else, a Citroën C4 Spacetourer will prove more soothing. We’d certainly avoid M Sport suspension, which is a cost option on lower trims or, funnily enough, standard on M Sport models. Thankfully, it can be changed to the softer set-up at no extra cost – something that we would recommend. You can also add adaptive dampers, which are a reasonable extra cost, but they’re not necessary to improve the ride. Even then, Comfort mode is still relatively firm, given that this is a family MPV. 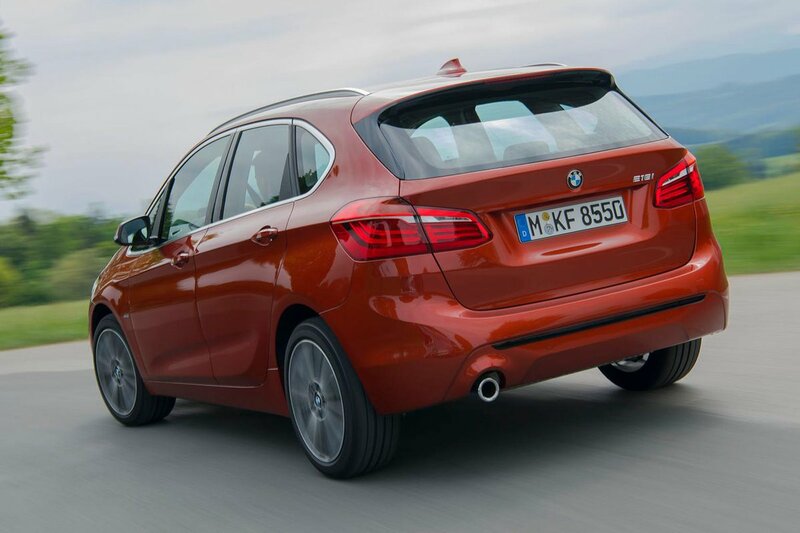 For a tall MPV, the 2 Series Active Tourer changes direction nimbly. Its steering – which has three weight options as standard – inspires plenty of confidence while also being light enough for easy use in tight parking spots. It’s certainly good enough that you shouldn’t pay for the optional Variable Sports Steering, which gets quicker the more you turn the wheel. There’s a bit of lean when cornering quickly, but nothing bad by the standard of the class and the body is kept in check over undulations or awkward cambers. If you’re intent on driving the 2 Series Active Tourer hard, the optional adaptive dampers’ Sport mode limits body roll further and makes the car feel more responsive by stiffening everything up. 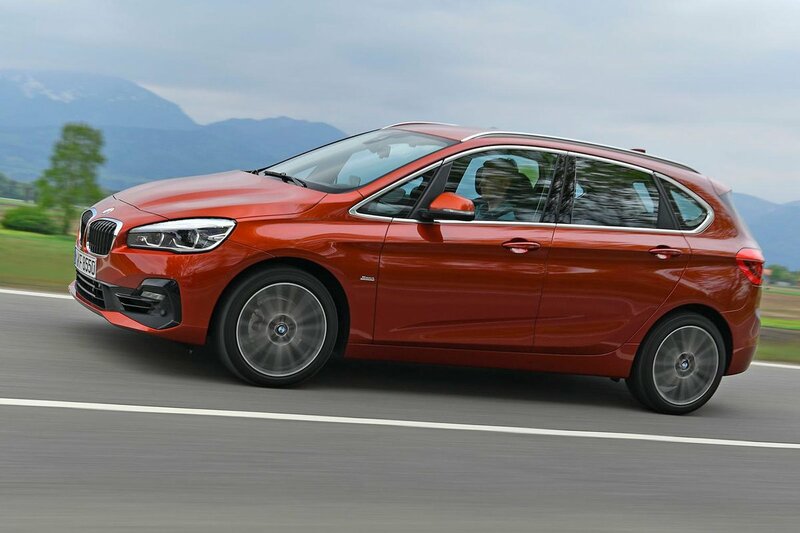 Even without the optional adaptive dampers, the 2 Series Active Tourer is more rewarding to drive than most high-roofed MPVs. If you want more security in serious slippery conditions, the 220d is available with xDrive four-wheel drive. The 225xe gets also all wheels driven, thanks to the electric motor powering the rear, but bear in mind that the big battery pack and electric motor add a fair bit of heft to the car – something you can feel when cornering hard. The 2.0 diesel engines in the 218d and 220d may not be quite as hushed as their equivalent in the Volkswagen Touran, but it’s not bad at all. Under normal use, they largely fade into the background, although they do become a bit coarse if you use all of the revs. Vibrations through the steering wheel and pedals are noticeable but minor. The 218i’s petrol engine has a characterful burble to it, but it’s quite hushed when you’re not accelerating. That said, you will feel a little tremor through the steering wheel at idle that can be blamed on the engine’s odd cylinder count. The 225xe proves even more impressive, thanks to its silent electric-only running. Even when the 25 miles of battery power has been used up, the engine kicks in smoothly, only becoming noisy at higher revs. The standard six-speed auto isn’t quite as impressive as the eight-speed unit, but it is still smooth. It’s a shame that the manual gearbox is so notchy, although the shift and clutch action are light enough to make it easy work. The eight-speed automatic available with the 218d and standard on the 220d is very smooth, delivering almost imperceptible shifts just when they’re needed while punching quickly through gears in Sport mode. Other engines are available with a seven-speed dual-clutch auto gearbox that’s smooth on the move, but can be a little bit jerky in stop-start traffic. The 2 Series Active Tourer is a hushed high-speed cruiser for the most part, regardless of which engine you choose. While wind noise is well contained for such a boxy car, coarse surfaces generate rather a lot of tyre roar as a result of standard run-flat tyres.